[ARCHIVED THREAD] - Why isn't the 7.62X39 AR more popular? Are there any specific problems or downside someone should know about before deciding to build one? I like mine, great fun. Occasionally they are finicky, but they are much better today. I would recommend an enhanced firing pin and heavy hammer spring. You've gotta put in the effort if you want a reliable rifle is the short version. The latter part of the above statement is definitely true for me. I haven't had need of an adjustable gas block or extra power springs. Good bolt and a heavy buffer are working great for me. I guess the real issue is that 7.62x39 rifles are rarely, if ever, an "perfect out-of-the-box" proposition. They require some tweaking and fine tuning to run reliably. Some people can't accept this even though they know the build is going to require it at the outset. It's not much different with scratch-built LR-308s/AR-10s, but people still build them all the time. And people are willing to work on these rifles to get them to function reliably. Just look through this section of the forums, there's tons of Q/A and requests for assistance on people trying to sort their builds out. 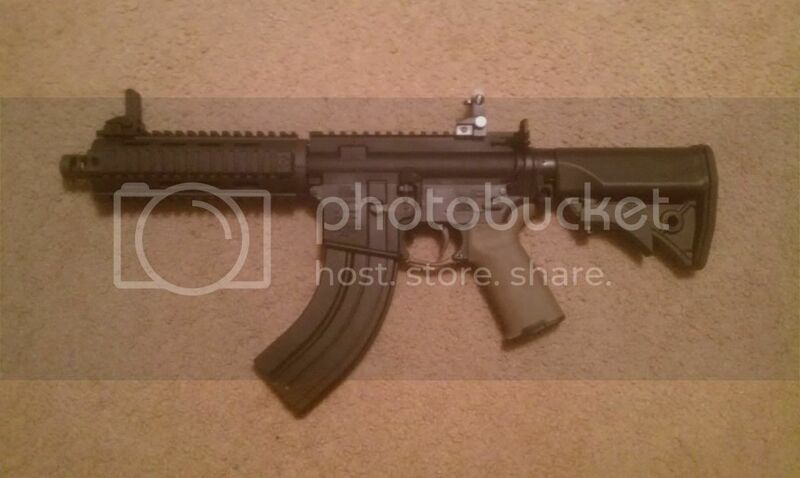 Just built mine, allot better than an AK. Just about got it running smooth. It's awesome having a little gun pack a hell of a punch. The AR magwel is designed around the relatively straight .223 round. While 7.62X39 is a strongly tapered round. So the top of the magazine has to be straight to fit into the magwel, for a round that was never designed to be fed like that. So they have reliability issues. They also have an unnatural and aesthetically incongruous and displeasing appearance to most, with 7.62X39 mags. I just ordered some parts for one of these...hope it goes well. Got the bolt, barrel and adjustable gas block from Tactical Ambush, so not too much invested as an experiment. 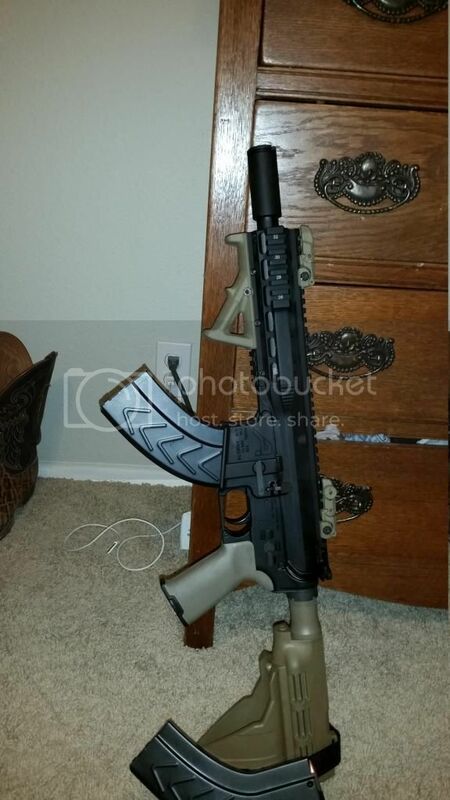 Worst case scenario, you throw away the bolt head and barrel and replace them with 5.56 stuff for $150 total (assuming you bought a $40 bolt head and $110 barrel on sale this week) and you have a 5.56 weapon when you're tired of 7.62x39 or run out of ammo. I dont see the downside to shooting cheaper ammo . Fortunately there are good magazines now that run awsome, I do agree that the high cap mags look awful but the 10 rounders look good and are more handy for most shooting. Like someone else stated, if u aren't willing to tweek it then it's not for you. I'm probably in the minority overall, but I am specifically taking on a set of x39 twin builds w/ 7.5" and 16" barrels as my first builds from the ground up. I think that this task will help me learn about how the AR system operates and although it may take some time to get them both running reliably I believe the knowledge gained will be worth it. Plus the smile on my face after a fully functioning mag dump with a system that I built and tuned will be priceless. Without trying to hijack the OP on this, I've just posted in BIY regarding barrel length on a build I've started for a 7.62x39 AR. What length gas systems for the 16" to 18" barrels seems to be best? Good luck on your build! Pretty much, building just an upper for now. I did get the whole TA/FailZero BCG though, so hopefully I won't have bolt issues. If it works well, a dedicated lower may follow later. Any suggestions for good magazines? I'm close to final assembly on my 7.62 x 39 and picked up 10 round and 15/30 round ASC mags from Franklin Armory. But I notice the follower is not anti tilt. And I saw a video where steel case ammo seems to have a mag related feeding problem. I'm planning to reload brass, but it would be nice to shoot the cheap stuff! Are the D&H mags any good? Which ones are the most reliable 30 rounders? I Just got testing the D&H magazine today, so all I can do is write my impressions good and bad. The test I did today were with an Armalite SPR 16" carbine in 7.62x39. I've had good success with the AR with 1500 rounds without a jam using CPD Inc. SS magazines and select ASC magazines in 30, 28 and 20 round capacities for the most part. I put 120 rounds through 1 D&H magazine, and 2 magazines each through ASC and CPD Inc 30/28 round magazines. The ammo used was Wolf 124 grain polymer military classic, so all told close to 240 rounds of 7.62x38 went down range. 1. The neon green follower is highly visible. 1. The magazine had trouble fully seating in the Armalite, it was tight to the point were it would not drop free. 2. The magazine was much harder to load than either the ASC or CPD Inc. 30 round magazines. 3. Trouble with the magazine bolt hold open. 4 magazines worth shot (120 rounds), 4 failures to hold open the last round. My CPD Inc, and ASC test magazines didn't have this problem. 4. The inside of the magazine feels rough, to the point where one round hung up on the feed lips causing a jam. 5. The follower is very like the "black" M-16 follower that had tilt problems with similar jams, one failure to feed (round porpoised), and one failure to go into battery. 6. The magazine catch would not fully engage. 7. The magazine protrudes noticeably further forward than either the ASC or CPD magazines limiting space on the rails. The majority of problems I had were in the last 5 rounds in the D&H magazine. I think the bugs can be worked out in the D&H magazine with some time. The problems may be due to the follower as many of the problems I experienced today I've had in the past with the black followers in the 5.56 magazine's. Of the three magazines right now I'd say the CPD magazine is better due to its Isonited SS CNC construction and 24 coil spring, followed by the ASC magazine that's heat treated SS with the Marlube finish. I hope the information is helpful. I want to build one soon. Mags seem to be the issue. Ironically USA magazines used to make what most people concider to be the best 7.62 AR mag, the Franken Mag. 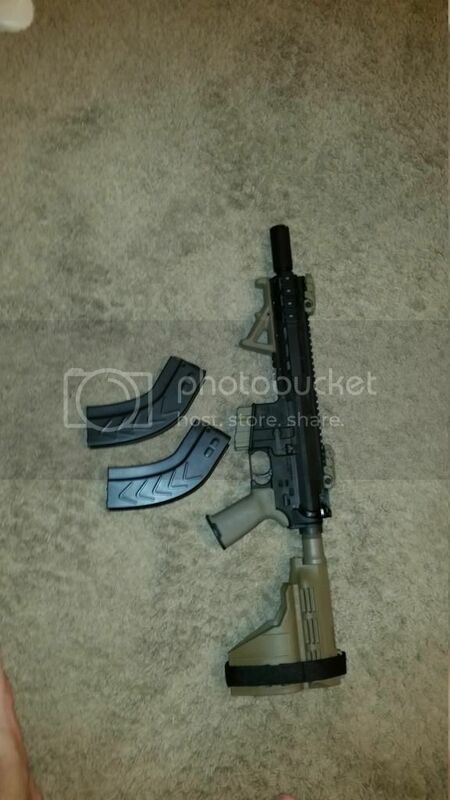 Basically an AK mag welded to an AR top part. I scored a bunch new in wrap locally years ago then sold them when times got tough because hadn't built a 7.62 AR yet. 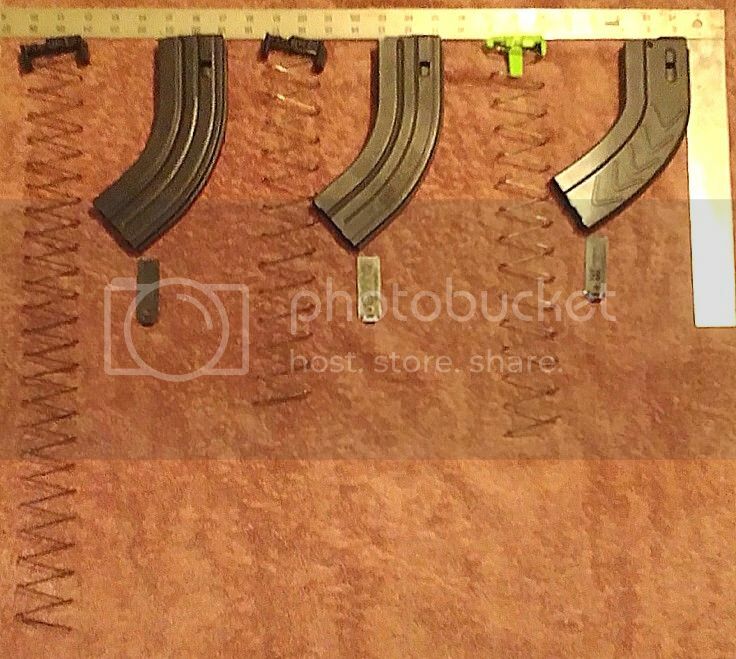 My question is: how come nobody else has stepped up and just started welding AK mags to AR mags? It is a proven design. The new c products defense magazines are gtg. Make sure you get the latest generation though. I use the 10 rounders and 30 and so far all have run perfectly out of a couple weapons. I agree, I've seen the 7.62x39 30 and 10 round CPD Inc. mags run great out of several rifles. Its going to get even better in the next year I beta tested seveal new CPD Inc., magazines, their new 28 round and 20 round magazines are super compact (the 28 rd fits in the same pouches meant for the USGI 5.56 mag), and a new coating that's comparable to NiBx will be available. The samples I tested for CPD Inc are Isonited which is a bit tougher than Marlube. The CPD Inc. Isonite and ASC Marlube finished mags are smoother than the the black finish on the D&H magazine that I tested. I have three, 1 Factory built YHM , one built Using All YHM parts and 1 alhpa shooting Sports Upper and Bolt All have been reliable using ASC 30 round Mags for me. Awesome, really looking forward to testing some. Interesting that the CPD mag has the longest spring, curious if that's a standard AK spring? I've heard of some swapping their AR 7.62x39 30 rnd mag springs for AK springs, I know my AK springs are longer than the stock ones in my ASC 30 rounders. Glad to hear good things about the CPD magazines. I have 4 ASC mags. Two 30 rounders and two 10 rounders. None of them seem to work well. This is after ASC replaced them for me earlier this year. They claimed they had some made "out of spec." New ones work just as bad as the old ones. I think C products is really putting some effort in these to get away from the old company's stigma. Definitely agree with this. Tried ASCs they were supposed to be the go-to mag on 7.62x39 rifles. Never worked right for me. C Products rock and roll without a hickup.